The purpose of my first book, Fly Patterns for Stillwaters, involved linking an understanding of stillwater food sources to fly design. Obtaining the right fly and presenting it in the right fashion is only one facet of this methodology. An integral part of this concept comes from knowing when to present one pattern over another. Traditionally we have used the obvious visual clues Mother Nature provides for us. The reality is that Mother Nature tends to hide most of these clues beneath the water's surface. Figuring out what is on the menu is not always easy. Since my initial baptism pursuing stillwater trout I have become obsessed with understanding the relative importance of each food item in the diet of the trout. This also holds true whenever I fish rivers and streams. When I go fishing, I keep comprehensive notes regarding air and water temperatures, lunar phase, successful flies, retrieves, and wind direction. 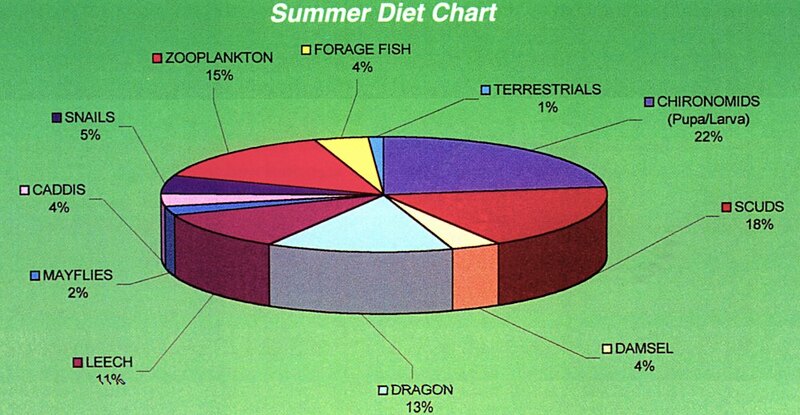 I obtain my most important observations via diet analysis. 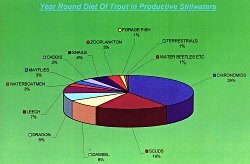 Through the safe and proper use of a throat pump, analyzing the stomach contents of the odd fish I kept or being a pest around the cleaning stations I found out exactly what stillwater trout were feasting upon. You should see the looks when I ask another angler if I can sift through the entrails of a fish they just cleaned. I have been making this a regular habit for years. The results have been both startling and educational. I know what food sources to look for and when they are most likely to appear. Knowing what and when makes pattern selection easier throughout the season. Although each area lake, pond, river or stream differs in terms of food sources and fish behaviour, I feel confident basing my presentation and fly selection strategies to any water body with reasonable success. 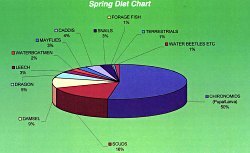 From my 20 plus years of note taking, I have compiled diet composition charts. 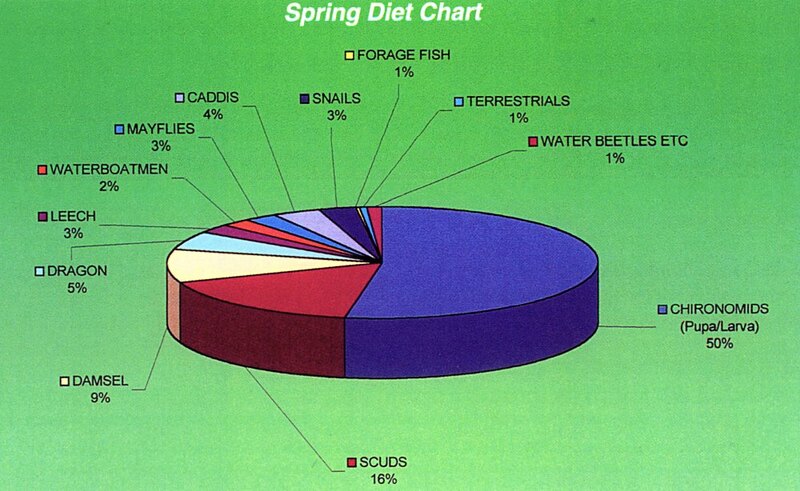 I have included a complete chart identifying the trout's feeding preferences over the complete season. In addition, I have broken down my data to give a snapshot of the spring, summer and fall. I hope you find these charts both educational interesting. Please feel free to apply them toward your own fly-fishing efforts.